I meant to share this at the end of November but barely got to my computer at that time. I decided to share it when I wasn’t so busy. What secrets do you suppose my two tortie girls were sharing? That cute tabby boy who’s been visiting from Midland Avenue? How annoying four young black cats can be to two “geriatric” tortie girls? A plot for tortoiseshell cats to take over the world? From November 28, 2011, this chance photo of Cookie and Kelly is cherished, and I’m sure I don’t need to explain why to anyone who has loved a household of pets of any species. What makes it especially precious to me is that I’d watched the two through years, getting older but not seeming old in any way. Cookie was 19, and Kelly was 18. They had never been real “buddies”, but this relationship changed in their teens, and especially after we lost Namir. Kelly was always sweet, but shy and timid, while Cookie was always friendly and congenial and tried to make Kelly feel at home for the 15 years they were together. In this moment where they were sharing my desk as I worked, Cookie had been bathing, Kelly sleeping facing the other direction, then they turned to each other at the same moment and shared a moment of deep friendship and communication. Cookie had been beginning to fail through 2011, and shortly after this it became clear that we would lose Cookie. I know Kelly was particularly anxious about the situation. Cookie, in her warm and comforting way, always tried to comfort Kelly. In this moment I truly saw it, and in the following months I wanted to keep the magic of that moment at that desk and made this photo is the desktop image for my main computer, at the desk where we spent so much time, and it remains there still for me to see when I work there, or even when I walk through the room. Cookie and Kelly on my computer monitor. Cookie and Kelly were the last two of my “old cats”, the “old guard”, two of my first rescues from those early years. They’d been with me all that time and seen so many other cats, so many changes in our lives. When they left many things changed about my household, with all fairly young adult cats. But living with them through decades taught me a lot about living with older animals—that it’s not too different from living with younger animals. You just let your heart lead the way and don’t be concerned about loss. I’d been working at that desk since 1998, and in that corner of the room since 1993. Cookie came to me in 1992 and I thought about all those years she had shared my life, healthy and devoted, happy to be wherever I was and assist in whatever I was doing. Kelly had joined us in 1997, and though it took a little time for her to join us in trust and habit, she was quickly part of the group and by the time I began working at home in 2000 she had her spot on my desk, this desk. All the years I’d worked at home she had been with me, nesting here and there, patrolling the two big windows, and now and then sitting on my lap. Those are extra sweet memories, and so many from so many days in all seasons as I worked through the day and often through the night, always with my cats at my elbows, on my lap or on my papers. During those years my cats, all my cats, lived longer and longer. Growing up in the days when we all let our cats outdoors, we rarely provided regular health care of any sort and might not even spay or neuter. I had once thought of 10 or 12 years as the lifespan of a cat, and when I took my cat Bootsie from my parents at her age of 12 and my age of 21, we really thought she didn’t “have much time left” and would soon die of old age or develop some condition that would suddenly take her life because, aside from spay and initial vaccines, we never took her to the veterinarian for anything. She was diagnosed with emphysema from asthma at age 15 and I was thrilled she lived that long. With each successive cat who lived to 15, 18, 19, 21, and even Stanley living to 25, I realized I had only misunderstood a cat’s potential for longevity with a good diet and regular medical care as needed, the same rules I followed for myself. In this way I have avoided many of the health issues and pratfalls possible from my genetics and avoiding societal habits and expect to live a good long time. Why not my cats? When we adopt an animal, do we have a set of expectations for how long they live? Is a 12-year-old cat to be avoided because they will only live with us a few years? What if they potentially live another eight or 10 in relatively good health? Is the cat safe to be adopted with that much potential longevity? Is it the fear of potential old-age conditions or the fear of a broken heart coming sooner than we expect? I took in Peaches as a foster at age 15 years and she lived to be 20 years. I took in Lucy as a foster at age six weeks and she lived to be 15 months. All expectations are out of our hands. A rescued cat or kitten—or dog or puppy or any other animal for that matter—can totally steal your heart in a matter of hours though it might only live a day. It’s not the length of time we spend with these animals, it’s the depth of our relationship. I forget that Peaches was only with us for five years because they were such rich and full years it felt as if we’d spent a whole lifetime together; in essence, we really had. Older animals are not afraid to develop a bond with us, nor should we be with them. Lakota, Emeraude, Kennedy, were all ready to trust me as a human caretaker and care for me in return, though each of them was no doubt aware of where they were on their spectrum. They lived as long as they could, unafraid of a broken heart. And if “senior” was truly a barrier to living with a pet, then what of the senior and even geriatric pets who live with us? I may have looked at my cats as they reached their late teens and early twenties and marveled at their longevity and health and I took that into consideration in their diet and care, but it never occurred to me to begin to distance myself from them for their age as it would seem to distance ourselves from older pets when we consider adopting. I think Sienna was getting some direction from the girls while spending time on my desk too. I’m learning all this from the tortie girls. 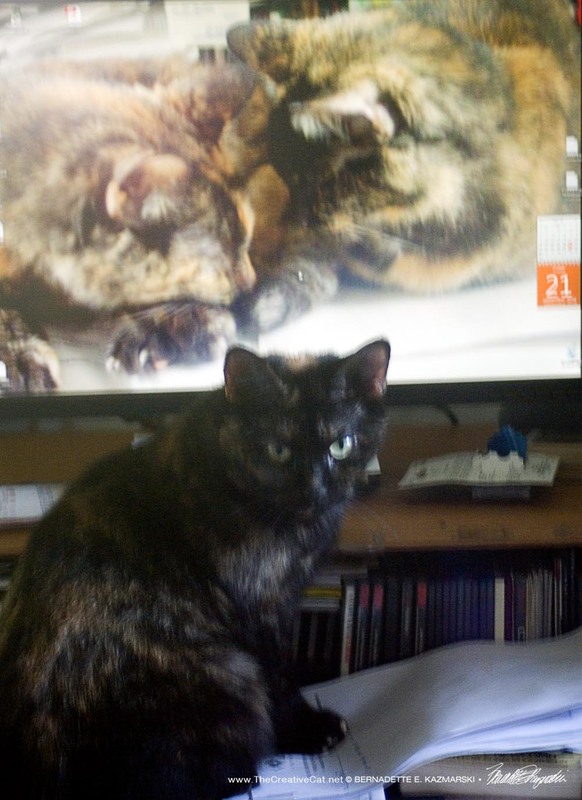 Tortoiseshell cats can be camouflaged against many backgrounds with all their irregular speckles and dots. This photo of Cookie taken in the spring of 2010 truly shows her ability to blend into her background as her orange and tan blend with last year’s leaves and her green eyes blend with the spring’s new growth. I could not love her more. Read more and purchase.